A previous post (15. The Belgian Narrative. Part 1: to the end of September 1914) looked at the development of the Belgian Narrative in the opening months of the War. This narrative placed Germany as the unprincipled aggressor prepared to crush any nation that stood in its way, and Belgium as the heroic but doomed small nation upholding its rights as an independent state. In the same narrative, Britain and the Empire, as defenders of Belgium’s neutrality, were drawn, reluctantly, into war in Europe against the military tyrant. Belgium’s heroic and fierce resistance had slowed the German plans for the conquest of France and brought precious time for the Allies. The resistance of the Belgians also brought out all the latent savagery and barbarism of the German nation and the world press was full of stories of German outrages and atrocities against the civilian population. The Belgian Narrative summarised the origins of the War in essential elements for patriotic Australians – the resolute Empire, the beastly Hun and the heroic Belgians – and through to the end of April 1915 it dominated Australian reporting of the War. 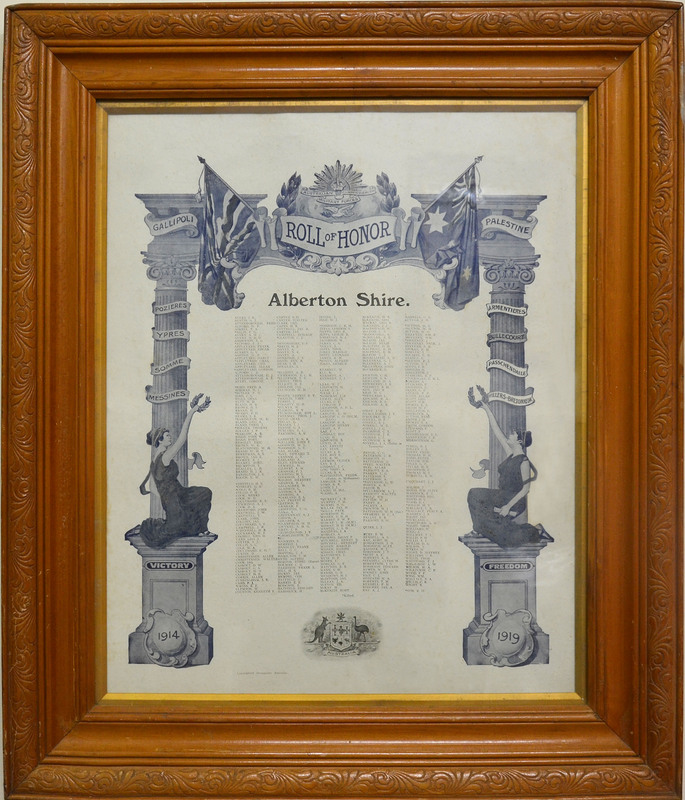 This post examines how the story of Belgium was presented in the Shire of Alberton and what the locals did by way of support for the cause. Post 15 concluded with an advertisement for a Handkerchief Afternoon Tea to be held in Yarram on 7 October 1914, with the proceeds to go towards Belgian relief. Admission to the fund raiser was by handkerchiefs for wounded soldiers. The following is an account, taken from the South Gippsland Chronicle of 9 October 1914, of this particular fund raiser. The headline was Patriotic Garden Fete. The residence of Mr. and Mrs. J. W. Fleming, of Yarram, presented a very pretty appearance Wednesday evening last, when a garden fete was held to collect money and kind for the Red Cross Society. … The residence and grounds were adorned with flags and bunting, emblematic of the British Dominions and allied forces. … A large number of the residents of Yarram and district were present and all expressed themselves freely of the splendid work of the host and hostess. … Refreshments of a very sumptuous nature were provided. Withal, the visitors were attended to in a right royal fashion, and all enjoyed themselves immensely. Altogether, gifts of 363 handkerchiefs, 36 tea-bags and 5 bandages were received, which is very commendable. The Hostess (Mrs. J. W. Fleming) requests us specially to make mention of W. G. Growse, of handkerchiefs, tea-bags and bandages. For all other donors thanks are also tendered. The amount collected per medium of the various games amounted to £2 10s. … This amount will, we understand, be given to the Belgian Fund. James Weir Fleming was a ‘manager’ of Yarram. He was an executive member of the local branch of the People’s Party (Liberal), a member of the board of management for the local Presbyterian Church and he would in time become a member of the local Recruiting Committee. William Charles Growse was a local merchant who ran one of the main emporiums (Growse’s Leading Stores) in Yarram. For fifteen years past the cult of brutality has been preached as the German spirit in the army, on political platforms and in the University. Brutality with the German nation has become a disease; all virtue has clean gone at the will of a military despot, who has demoralised his people with the one thought of gaining power by brute force. The guiding principle of “do unto others as you would that they should do to you” has had no place in the hearts of the German leaders, otherwise the peace-loving Belgians would not have had their neutrality violated, because they resisted the depredations of a burglar nation. They were ruthlessly murdered – men, women and children. What is Christmas for the brave little Belgian nation today? A desolate country, with the pall of death spread over their fair land, for daring to intercept the march of a foe intent on battle. In Brussels over 200,000 people every day wait in the snow for their bread. In Liege, where for 6 months the bravery of a small nation altered the whole complexion of the greatest war in history, 30,000 old men, women, children and cripples daily line up to get their half pound of bread and litre of soup, which alone enables them to live. Babies and children are barely kept alive for want of milk. The paper reminded its readers of the debt owed to the Belgians – We in Australia have been asked to help these most deserving people, to whom we owe our liberty today – and listed in detail all contributions, both in cash and kind, that had been received. The paper called for the setting up of a committee to manage the appeal. In the same edition, the editor had organised for a letter from the Reverend F Tamagno (Presbyterian) to appear in support of the contribution scheme. The Rev Tamagno would become another key player in the local Recruiting Committee. The letter itself stands as something of a classic account of the Belgian Narrative. I am sure that the appeal to loyal Australians, from Belgium, will be generously responded to. Surely the faintest hearted Australian can now see that little heroic Belgium gave Britain and France time to gather their forces together and meet the nation of “kultur”. There is no doubt that had Belgium assented to Germany’s diabolic demand, to march through her country unmolested, then France would have been the awful sufferer, and most probably Britain would have been seriously hampered from getting her transports quickly into France. Can we who know very little of indescribable agony and want shut our ears to the bleeding nation of Belgium? Will we not prove our intense admiration of the Belgian people by giving month after month a few shillings each to sustain starving men, women, children and babies? Sacrifice! we know not the meaning of the word. Let us do immediately and constantly something practical, which is the beginning of sacrifice. God forbid that, through our indifference, millions of Belgians should continue to suffer and starve, when it is in our power to relieve them, hearten them, and give to their succeeding generations the sweet consciousness of a nation’s heroism. I suggest that all who can will contribute, month by month, towards the fund you have opened in your columns. Every man, woman and child among us ought to keep on doing a little regularly, until either Belgium gains her freedom, or the devilish foe is forced out – baggage and body. I enclose 5s, and I shall continue to do so month by month, until heroic Belgium breathes yet once again the air of peace, hope and love. The appeal was for locals to contribute a fixed amount on an ongoing basis. There were more letters in the next edition (3 March 1915), together with lists of more donors – now nearing one hundred – and a breakdown of their individual donations. The total raised stood at £176. The letter by Ben Percival Johnson – a well-known lawyer in Yarram who would become heavily involved in key patriotic associations, including the Recruiting Committee – also laboured the idea of the debt owed to Belgian for holding up the German advance. He argued that the Belgians … could easily have protested against the German invasion and then let the invaders through. The result would have been the loss of many more lives, the infliction of much more suffering and sorrow, and the expenditure of millions more in money by the people of Great Britain and her colonies, that is us. France would have, for the time being, crushed; Paris and Calais would have fallen, and, perhaps, Britain invaded, for our army was too small to offer any serious resistance to the hordes of trained Germans. Belgium saved all this, and their pathetic appeal should meet with the most generous response. Future editions kept up the appeal for Belgium with the growing list of donors being published. The practice created a type of honour board of patriotic citizens. A formal fund-raising committee was duly formed and it included clergy from all faiths, including Fr Sterling (Catholic), Rev Tamagno (Presbyterian), Rev G Cox (Church of England). At this point there was very much a combined religious front to the War, and both France and Belgium, the 2 nations suffering most at the hands of the German invaders, were Catholic. 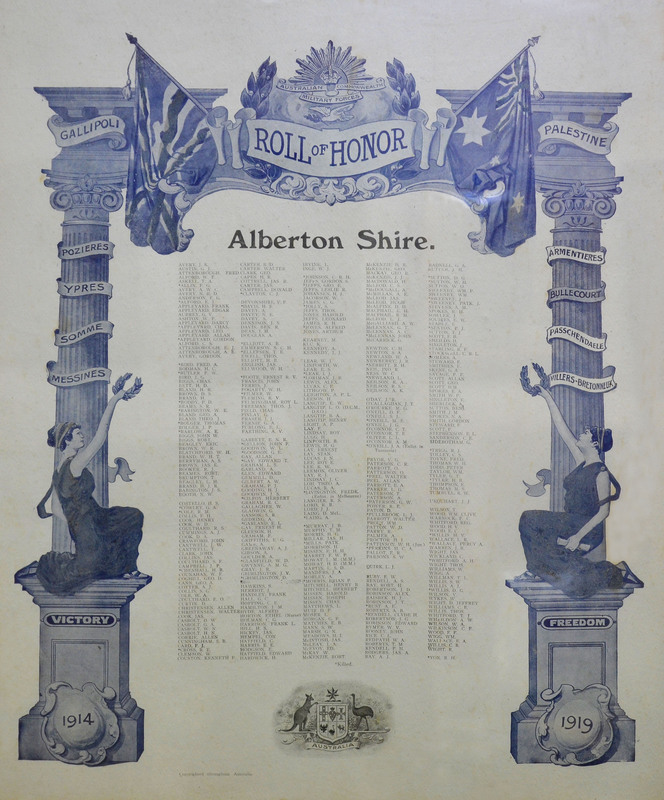 Another key committee member was A J Rossiter, the editor of the Gippsland Standard and Alberton Shire Representative. The first meeting of the committee closed with everyone there singing a verse of the National Anthem. The grand total continued to grow. At the start of March 1915 it was £257. The committee stressed that the fund was not a case of charity, rather it was about repaying a debt owed to the Belgians. But not everyone was as committed as the members of the committee and the conviction that people had to be made aware of their responsibilities – set to become one of the most critical political themes of WW1 – was there from the start. Rev. Tamagno wrote in the paper (23/3/15), The people must bear in mind that there were 7,000,000 Belgians to be fed. Some people seemed quite unconcerned, but they must be woke from their slumbering, and be induced to give in large or small sums. By the end of May the total was £716. The Shire’s efforts were being mirrored all over Victoria and the nation as a whole, and across the Empire. Newspapers throughout Australia over the first half of 1915 featured countless articles on funds being raised for Belgian relief. As a quick comparison with the Shire’s efforts, articles in The Argus gave Ballarat’s total to early May (12/5/15, p. 10) as £1,350 and Broken Hill’s to the middle of June (18/6/15, p. 4) as £2,625. The funds were distributed by the American based Commission for Relief in Belgium, whose chief executive – and future US president – Herbert Hoover, had been recently involved in the mining industry in Australia. Evidence of just how pervasive the preoccupation with Belgium was in the first year of the War can come from the most unlikely places. For example, in March 1915 a new football club was formed in Yarram. The Gippsland Standard and Alberton Shire Representative (31/3/15) reported that an attempt was made to call the team the ‘Yarram Imperials’ but this rather patriotic title lost out to the far more specific ‘Yarram Fire Brigade Football Club’. However, on the issue of colours, patriotism did win out: The colours were under discussion, when a smart looking guernsey was placed on the table, red and yellow. It was suggested that the letters be black, so that the players would bear the Belgian colours. This, of course, appealed to the patriotism of all present, and these colours were adopted amidst applause. From late April 1915, reports of events unfolding in the Dardenelles would come to dominate Australian reporting of the War but even as the focus shifted to the experiences of Australia’s own soldiers, the plight of the Belgians was still being written about. The following account is of a fund-raising concert held at Kjergaard at the end of April 1915. It was published in the Gippsland Standard and Alberton Shire Representative on 7 May 1915. The chairman called on Mr. N. J. Cook, head teacher of the Blackwarry State School to address the gathering. Mr. Cook referred to the appeal to help the brave little Belgium nation, which had been trampled upon by a relentless foe, and was now in deep distress – an appeal that would not be made in vain. Germany expected to have got to Paris, and would not have been disappointed had she not been held fast at Liege and Namur. They all had admiration for the brave Belgium nation. Total receipts for the night came to some £18, and the duck in question – clearly a key player in the night’s entertainment – fetched the princely sum of £1/1/6. After the speeches and auction, the hall was cleared for supper and dancing. The purpose of the night was serious but it was also a an opportunity for the community to come together and socialise. Late in May 1915, (Gippsland Strandard and Alberton Shire Representative, 26 May 1915) Alberton Shire received its share of 1,100 ‘Belgian Buttons’ to sell. They were 1s each and were sold from a number of businesses in Yarram. The slogan that went with the buttons was, “Be a Briton! and buy a button for a ‘bob’ to buy bread for the Belgians!” The ambitious plan was to sell one to every adult in Australia (2.7M). Like the lists of donors which was published regularly in the local press, the buttons were a means of identifying those in the local community who were serious about supporting the Belgians. Tellingly, the buttons came with a new measure of patriotic commitment: There are two kinds, one for those who have father, husband, son or brother at the front, and these have white circle round the edge; the other kind is for those who have no near relative at the front. The design of the buttons is a tangible illustration of how the Belgian Narrative became a test of commitment to the Empire and the War. The Belgian Narrative was always more than any simple or even heartfelt account of the terrible fate of Belgium. It became a test of commitment. Finally, to emphasise the extent to which the Belgian Narrative was both interpreted and presented within Christian teaching – it served as a modern parable – consider the following poem written by J. C. D of Welshpool, which appeared in the Gippsland Strandard and Alberton Shire Representative on 14 April 1915. Little of the poem’ s intent or style strikes accord with modern sensibilities, but it does demonstrate how for some – or many – the War had to be seen as some expression of divine purpose, where both the generic call to arms, and the more immediate appeal for Belgium, were divinely sanctioned. Hurtle the portents of colossal war. In crises and abysses of alarm. To kindle and consume, but not expire. With power growing ever to give more. This entry was posted in Belgium, January to June 1915, Religion & Community on March 18, 2015 by pcashen.